Riding a motorbike? Driving a small car? Meet your harassers! Ever wondered why they allowed the dark tinted windows, cool registration numbered luxury vehicle go without even looking at it but ask you to pull up? As a reporter in Islamabad, my job mostly requires me to look-after assignments in the Red Zone. Security measures are stricter in the area and are routinely “beefed up” when the country faces any kind of terror attack. After the Army Public School (APS) tragedy in Peshawar, which took place a little over a month back, major cities across Pakistan received threats. To counter these, the authorities have come up with a number of security measures. Among many other things, we saw the controversial death penalty being restored; the international community, however, feels this not an effective deterrent to deal with terrorism. In my opinion, it is important to understand that the strategies used to achieve these objectives should not require the use of terror. It is here that the importance of designing and putting into place effective day-to-day security measures are stressed. It is during this time, however, when educational institutions were closed after having received threats, that security, as usual, was upgraded across the capital. The unfortunate part about our security being beefed up is that, sometimes, even you start to feel like a terrorist in your own country. While it is great to see our policemen actively manning all pickets, erecting obstructions, flashing torches inside private cars – it’s the look they give to certain unfortunate individuals that make you feel anything but secure. On New Year’s eve, I was making my way back home at around 1am, when I saw a cosmetic check post with plastic barriers right in the middle of a dark road, obstructing my way. A tiny but blinding torch light was flashed into my eyes and I was asked to unlock my car. I obeyed the inadequately equipped policeman. Without a word, he peeked in, pulled out a transparent plastic bottle which had a few sips of water in it and stared at it suspiciously. He then swirled the water in the bottle as if he was at a wine tasting event. There was no attention paid to check for explosives; I wasn’t even asked to open the boot of my car. When he saw the pile of clothes on the back seat – because of my hectic routine, I sometimes change in the car – he probably thought I ran a laundry service, he asked me what I did for a living. Within 30 seconds of telling him that I was a journalist I was on my way home again. Ever wondered why they allowed that dark tinted windows, cool registration numbered luxury SUV go without even looking at it but asked you to pull over? Well, this is most probably because you drive nothing bigger than an 800cc-1000cc vehicle that was assembled in Pakistan. The small car owner is rarely a VIP or well-connected citizen who will use his clout to get out of being inspected. For the police, unfortunately, small car owners are just dollar signs driving away. They would never give up an opportunity to make that extra buck! If you are young and on a bike, be prepared, for it is your fate to be stopped and questioned. Most criminals – which the news media conveniently refer to as “unidentified motorcyclists” – became the bane of existence for those who cannot afford to buy cars. 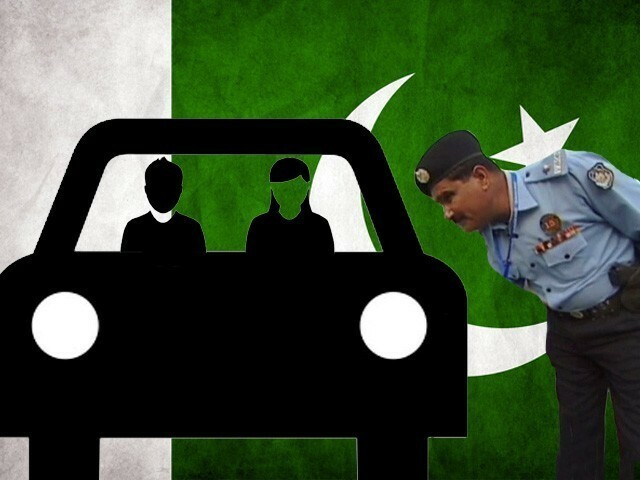 While I understand that the country is on high alert and it is the job of every police officer to stay alert, I strongly protest this discriminatory way of checking motor vehicles. If stopping small vehicle and motorbikes was a sure shot at capturing terrorists, with the way things are going, by now Pakistan would have caught them all! But since that hasn’t happened, there must be something we are doing wrong. Although there are many reasons to question the action of Rangers, the fact that they check every car still gives me the satisfaction that a hot-shot terrorist has an equal amount of chances at being caught as one on a motorbike. But these police officers, however, will leave no stone unturned to harass, not inspect, and make the lives of those travelling in small vehicles absolutely miserable. I applaud their work, but I condemn their ethics. I hope someday our police is as efficient as they look they are. What happens after 1000 days? Baba ….its an unfair world…….you just have to make the most of it. So far, have read 15 to 20 variation of this theme. in Hyderabad. Now in Islamabad.